A repost from 2016, a good reminder of the importance of vacation. Blessed with two weeks in the “Beautiful Place by the Sea,” our respite winds down after a myriad of experiences. We laughed, walked, rested, feasted, were cultured, went nautical and squeezed in a showing of Finding Dory. I’ve been coming here since June 1982 and this place still does not disappoint. In 1982, I was in search of healing. Having unexpectedly lost my mom to a sudden heart attack in 1979, twelve days past my sweet sixteenth birthday. 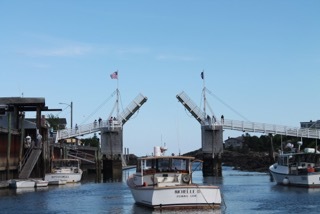 Over the years I have enveloped every emotion in Ogunquit. Tears seem to find me easily here, as I continue to consolidate what is transformational shifts in this season of life. It seems I have fully released the hurt I was harboring from failed relationships, not fitting in, struggling to pay my $50 a week rent back when I lived and worked here in the summer, and the many fond memories I had of Valerie’s Restaurant and Piano Bar and the family that ran it. 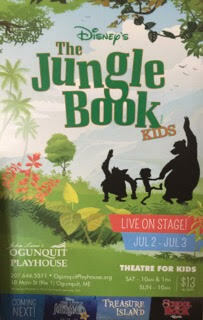 My daughter Kate, a five-year attendee of the famous Ogunquit Playhouse Children’s Theater Camp made it to “junior” players and performed in the ensemble of Disney’s The Jungle Book. She performed for three sold out audiences, and it was thrilling for us all. She informs me she’d like to live in Ogunquit all summer and perform in the other shows throughout the season, too. Yeah, me too. That’s a dream. How can I run my business and finance a summer in Maine for the next several years to come? Throwing it out to the universe and praying about that! In other years up here, I overschedule and worked every day with my leadership coaching clients. This year I declared I would not have a “working vacation” and to just “be.” Five naps later, I am rested and ready for what God sends me next. Change is imminent. I learned that dear friends/neighbors of 14 years were putting their house for sale and there would be a sign in their yard upon our return. Downsizing. We are officially the last of five original families in the neighborhood that did progressive New Year’s together and watched our kids grow up. The average age of the neighborhood is roughly 38 now. That’s how old I was when we moved in. What is next in the novel of life? We discuss downsizing and simplifying all the time. 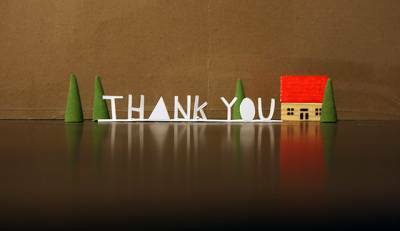 We love our neighbors and have a lovely home, but is it time for change? I’ve been counseled to start to look for signs: what would it be like to have a small place in MD and an even smaller place in Maine? As much as I try to go elsewhere and try out new locales, the pull to this place is magnetic. It’s fun to think about the potential. 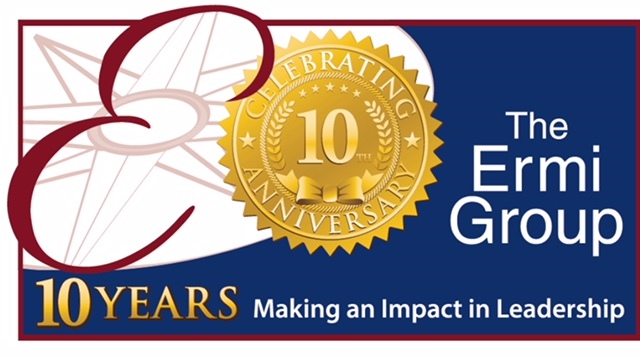 In past years, I end up doing a lot of strategic planning for The Ermi Group. 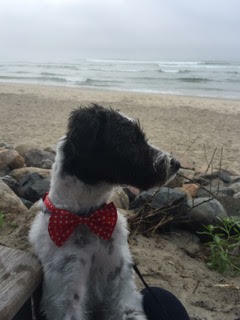 Every time I tried to go there mentally, something brought me back to friends, family and our puppy (first time to the beach!) One of the inspirations I had this trip was to weave more music into my life. Articles about neuroscience and music, coach colleagues using music in their practice. I bought a package of five voice lessons starting at the end of the month to see where that takes me. Well, so long beach, Marginal Way, sound of the surf, sand in my toes. I’d like to return alone for a couple of days where I can incorporate intentional mindfulness practices versus coordinating everyone’s activities like homework, food, laundry. As gratifying as domesticity is, it is not the impact I want to make in the world. Time for change. Time to regroup. Time to get clear on what it isn’t to make room for what it is. Seasons’ change falls upon us. Spring ahead, cherry blossoms, and jonquils grace our landscape. Saint Patrick’s Day beams of green and our lawns will soon follow. The promise of spring has many connotations for people, and this blogger is no exception. In previous posts I wrote about SAD – seasonal affective disorder, often referred to as the winter blues. Once treated this very real and disruptive condition can make the doldrums of January and wretched February more bearable. But spring is the elixir that soothes the soul. Spring is the renewal of hope, growth and vigor. Not only is it visibly evident, but the energy lift is exponential. The neighbor kids are frequent visitors again since bringing the new puppy Oreo home last week, and I am reminded of the hilarity of spring fever. 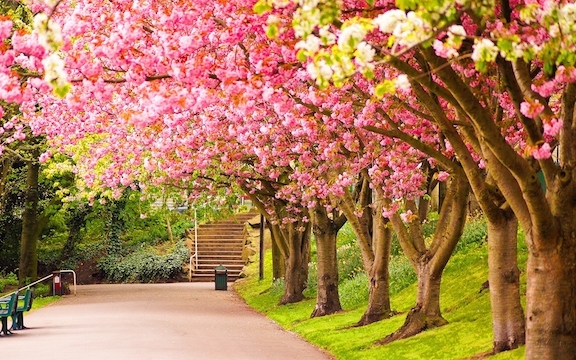 We hear more and more about Vitamin D deficiencies, and spring is nature’s antidote. From a business perspective, I am experiencing a trend of revived interest in development. I have literally written six requests for proposals in the last week. I envision these leaders as bulbs peaking up from the ground, reaching for the sustenance of the sun’s rays, and realizing they may need some support to fully blossom. What a privilege to be considered as a safe partner for that growth to occur. I profess a spirit of gratitude and love when I see neuroscientists writing about how this simple yet often uncommon practice has the same impact on our brain chemistry as many medicinal alternatives. I’ll take gratitude over Prozac any day. Intentional practices are key. The clergy have known quite a bit about gratitude for millennia. My Pastor told us this past Sunday, “Imagine waking up today with only those things you thanked God for yesterday (showed gratitude for)?” Humbling and sobering thought. Even my daughter Kate’s school has adopted a theme of gratitude in the integrated curriculum this year. 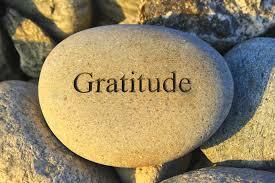 As we welcome in spring, take a pause and reflect: what are you grateful for today? 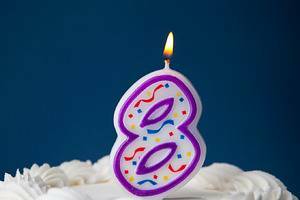 Year in Review: The Ermi Group Turns 8! December is a blend of fury from the holidays and reflection of the past year, and excitement for the year ahead. January feels like new beginnings and even a bit anticlimactic. The Ermi Group is winding down its seventh year in business. As a certified Woman Owned Small Business (WOSB) we have experienced the joys of entrepreneurship as well as the challenges of facing the unknown of the economy. We are pleased to report 2015 was our most successful year to date. Serving well over 200 clients in over 20 organizations in 2015, our team of coaches and consultants have been able to connect with leaders in transformational ways. We take pride in our passion for continuous development and added new certifications to our credentials, and invested in keeping current on best practices in leadership development by investing in over 100 hours of continuing education. We are grateful for our Georgetown University colleagues and make sure we are in forums with coaches all over the world so we bring the very best to our clients. In order to serve our clients well, we are passionate about continuing education, staying current with best practices and adding to our vast tool kit. A new certifications we will be engaging in this coming year is Scott Eblin’s Life GPS® program, a companion workshop from his recent best seller Overworked and Overwhelmed: The Mindfulness Alternative. The book challenges us to reflect on when we are at our best and what are those characteristics in defining and living that. In preparation for the certification, I have been thinking about what that means. Life is a blur sometimes, and carving out quiet time to pause and reflect is a challenge. I met with a high potential leader the other day, and she really inspired me. She was able to confront some self-limiting beliefs, say them out loud, and commit to a practice to start hard-wiring new ways of seeing herself. I was proud of her. Her realization was breakthrough for her, and I got chills from head to toe as she discovered these unconscious beliefs. It’s moments like these I know I am doing what I am supposed to be doing: supporting clients, giving them a safe place to figure out their shadow side, holding the space to be authentic, without judgment. I say this to my team and colleagues all the time. 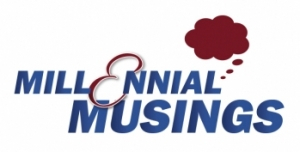 “What a blessing leadership coaching is a career! Finally, executives know that having a coach is a strategic differentiator, and not something punitive.” I am prepared to take on my eighth year as a small business owner, and my journey up until is a powerful foundation. My team, coaches, consultants, friends and family are incredible enablers, our gratitude is boundryless. 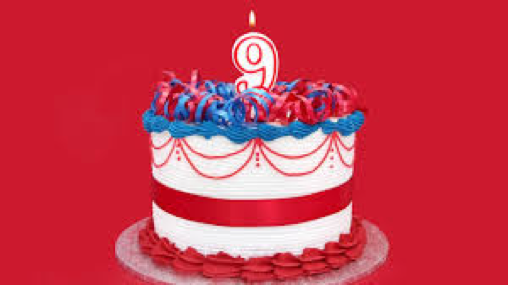 Here is to our 8th year! Thank you to our leaders who allow us to help them explore their potential, as they bring out the best in themselves and others. May we dream of a New Year that is safer, where we consistently show up at our best. When you think about your favorite season, what do you think about? Sunshine, blooming flowers, the beach? Or how about bonfires, colored leaves, and pumpkins? I think about cold air, a barren landscape, and snow. Yep, that's right. My favorite season is winter. Quite an anomaly I would say. Maybe it's because I was born in January, maybe it's because I am just strange, but all my life it has been this way. I love winter. Some of my happiest memories take place in the winter. As a child, I remember the first snow day that school was cancelled every year, my dad would take off work and we would go skiing. We would take my neighbor/best friend and who ever else could come at the spur of the moment. Sometimes we would have a whole van full. I remember learning to ski for the first time. I was 8. I was hooked. Flying down a snow covered mountain at high rates of speed...who couldn't love that?! I remember building snow igloos with my neighbor in giant piles of snow in my yard, left from shoveling my massive driveway. We made snow ice cream, snow angels, and snowmen. The whole neighborhood would race to sled down our street as many times as we could - it was a nice downhill slope - before the plows came. When the plows would come, we would throw snowballs at the poor guy's truck who was just trying to do his job. But hey, he ruined our sledding! 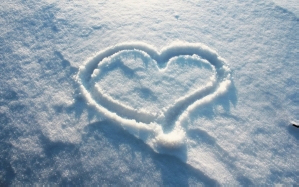 Aside from all the fond memories I have of winter, there are so many other things I love about it. For starters, all the mosquitoes, gnats, and other pesky bugs die a certain death. I can enjoy my yard without being eaten for lunch. The dry air is kind to my naturally curly frizzy hair. The cold crisp air is fresher and cleaner. Not stagnant and choking you with it's heavy humidity. And the snow. I can't forget about the snow. I love snow. Yes it's cold and wet, but it's beauty makes up for that. The way it softly and quietly covers the world in a blanket of white is amazing to me. The white world looking so pure and innocent. When the sun hits it, it sparkles in a way that nothing else on earth can. Each snowflake is special and unique. Looking at the snow covered world immediately brings me a sense of peace. Everything is suddenly ok. Stress is gone. Joy surfaces. Then there is snow's cousin, frost. 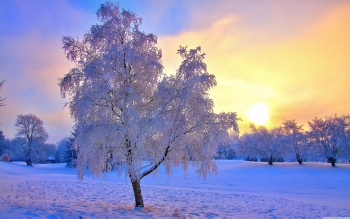 The frost covered grass and trees are also a wondrous sight. Nature's glitter. It only lasts for a few hours before it disappears, so marvel in it while you can. In the winter, everything is dead and barren. I think this is a big reason why most people don't care for the winter. When there is no snow, everything is brown. They prefer the green grass, full trees, and flowers. I see it differently. During the fall, everything slowly dies. The leaves bare beautiful colors and then fall to the ground, dead. To me, this death is beautiful. Sounds crazy, a bit morbid, I know. But the way everything dies brings me peace. It's quiet. The chirping birds are all gone. There are no buzzing bees. There are no neighbors mowing their grass way too early on a Saturday morning. Everything is dead. But the truth is, that it's not really a death. It's more like a resting period. A break. We all need a break. Even mother nature. In a few short months, her vacation will be over and everything will come to life again. The birds will return with their songs, the sun will shine brighter and longer. And the seasons will continue to circle from birth, to life, and back to death again. So for those of you who don't care for winter, you are entitled to do so. But try to look at it in a different light. Take in the quiet, feel the peace, appreciate the only death that is not permanent. The cold death of winter can only make you look forward to the spring all the more. Thanksgiving has always been my favorite holiday. I tend to have a heart of gratitude, and have spent many years reminding myself how blessed I have been. This holiday just fits with my lens of life. 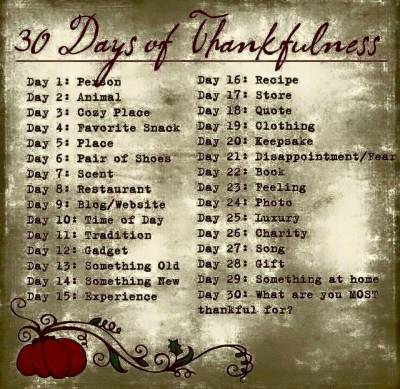 My friend Stephanie Tarant recently posted this and it caught my eye, so I will attempt to complete this, for no other reason but to be intentional about why Thanksgiving and thanks giving are important to me. Day 1 - Person - there are so many, it is challenging to choose one, but I will choose my dad. He is 86 now, and has always been my biggest supporter. Whenever I need someone to go to for some empathy, my dad is my go-to-guy. He always knows what to say, and I was very fortunate to be raised with lots of love and encouragement. I am sure that has resulted in my confidence and passion for helping people. 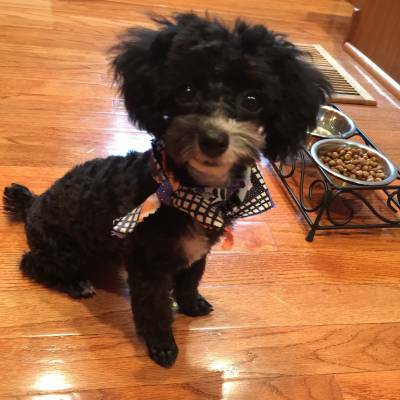 Day 2 - Animal - This little ball of love just joined our family last week. Welcome Buddy! Day 3 - Cozy Place - Cuddling with my Kate and new pup in my favorite chair in the sunroom. (proactive) Day 4 - Favorite Snack - I make a pretty mean Buffalo Chicken Dip. In fact I was recently requested to make it for the Washington Redskins/ Buffalo Bills game in December. How about you? Can you take a few moments during November and intentionally and mindfully think about 30 conditions to be grateful for? I'll be back with periodic updates and would love to hear from you too!